We met by being on the rodeo team together. I, Kelsey, was a sophomore that was the teams photographer, videographer, secretary, you name it. Jesse was a freshman bull rider from Alabama! Anything that happened on campus, we went together! From sporting events to Big Money Bingo and and SAB events! We could work out together, go play pool, and hang out at the Barn! Since we were both AG majors, we even worked on SAU farm together! Rodeos, bull ridings, and more rodeos! We started dating in October 2011, and then married in the SAU arena in May 2015!!! So little over 4 years! Nothing is a special as our wedding day! 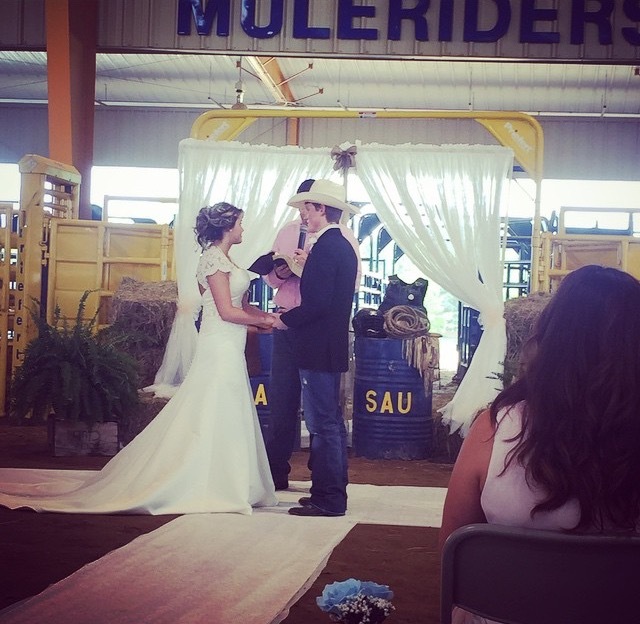 How many people get to get married within a football field of where they took their first picture together and where the center of our life was, SAU Rodeo.